Transit in suburban Mexico City: if you build it, will they come? And ride? Over the past decade, governments and development agencies have invested significantly in high-capacity transit in Asian, Latin American, and African cities. Beijing’s subway system grew from just two lines in 2000 to one of the world’s largest metro systems today. Each year, a dozen new Bus Rapid Transit (BRT) lines open in cities around the world. Concerns about economic competitiveness, congestion, sprawl, pollution, and accessibility for the poor and middle class motivate these investments. Despite increased high-capacity transit investment in many developing-world cities, little research has evaluated its effects on land use or travel behavior, particularly in fast-growing suburban neighborhoods. Yet the effects of transit investments almost certainly vary in areas with different spatial patterns, land use regulations, travel habits, and income levels. Most existing studies are either descriptive or recommend a specific technology—generally BRT—based on costs and passenger volumes. 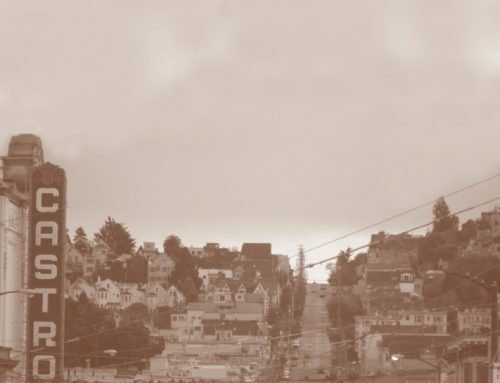 Several studies focus on factors that influence households’ mode choice on existing systems, and the relationship between proximity to transit and land values. As in other metropolitan areas, Mexico City’s population has grown primarily in suburban neighborhoods, far from metro or BRT stations. Despite limited transit service, Mexico City’s suburban residents use transit for a higher share of trips than central city residents. Suburban households rely on a combination of privately owned and operated minivans and minibuses and publicly owned metro and buses. When Mexico City Metro’s Line B opened in 1999, it significantly expanded high-capacity transit into the large and densely populated suburban municipality of Ecatepec. The investment appears to have increased population density around suburban stations with limited or no influence on downtown development or regional growth patterns, and improved transit service for local residents with limited or no effect on congestion or car ownership. The effects of transit projects depend on the cities and neighborhoods where they are built. Dense, diverse areas with pedestrian-friendly designs tend to bolster transit ridership by increasing the speed, convenience, and reliability of transit relative to driving. Due to income constraints or personal preference, transit users may live in dense, diverse, transit-friendly areas. Dense concentrations of people and jobs promote high transit use due in part to an increase in the total number of origins and destinations in a transit system’s catchment area. Below a certain density threshold, neither land use changes nor transit investments are likely to influence ridership. In many developing-world cities, even the most peripheral neighborhoods often surpass these minimum density thresholds. Mexico City’s suburban neighborhoods have an average density of 60 people per acre, well above threshold densities established in the United States for even the highest-capacity, heavy-rail systems. Dense concentrations of people and jobs promote high transit use due in part to an increase in the total number of origins and destinations in a transit system’s catchment area. High-capacity transit has the largest influence in places where real estate markets are strong, government regulations and financing are supportive, and the accessibility benefits of new service are high. In the United States and Europe, these conditions are most prevalent in downtown areas. However, even in dense, centralized regions with rail systems and strong real estate markets, jobs and populations have grown more quickly away from transit stations than around them. Thus, while transit has increased centralized development, it has not necessarily prevented decentralized development. In Mexico City and many other parts of the world, real estate markets, land use, and regulations are somewhat different than in the US and Europe. Several academics have argued that high-capacity transit investment increases downtown development and commercial activity in developing-world cities. Suburban impacts, however, may be at least as important. 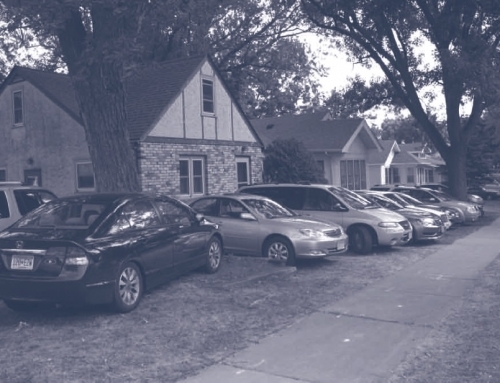 Suburban neighborhoods tend to have strong, informal real estate markets (particularly for housing), light and weakly enforced land use regulations, and high transit use. This suggests that transit investments may bring large accessibility benefits and produce significant land use changes in suburban neighborhoods. Furthermore, the white-collar workers associated with downtown commercial developments in Mexico City rarely use transit. 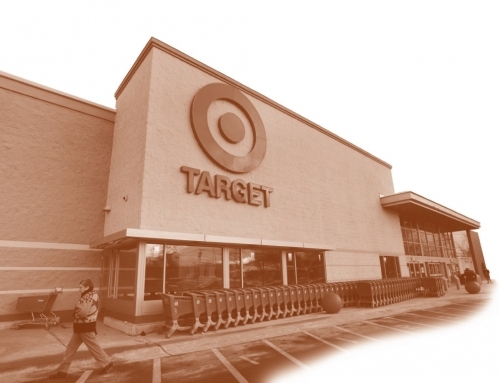 As such, transit investments are unlikely to spark significant commercial office developments. Mexico City’s metropolitan residents live in dense neighborhoods (67 people per acre on average) that rely on transit for almost two-thirds of all trips (excluding pedestrian trips). In this sense, Mexico City exhibits the most commonly referenced and strongest aspect of the transit and land use connection: high densities support high transit use. The transit system consists primarily of a 225-kilometer metro network that provides high-capacity service in the city proper, and a diffuse network of colectivos—privately owned and operated minivans (combis) and minibuses (micros)—that provide feeder and local service throughout the metropolis. 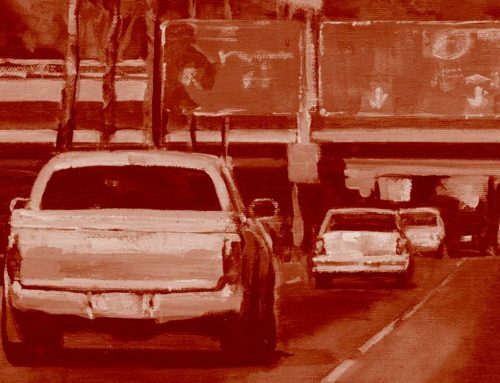 On an average day in 2007, 52 percent of all vehicular trips relied on colectivos for at least part of the journey, while 32 percent of trips relied exclusively on this mode. 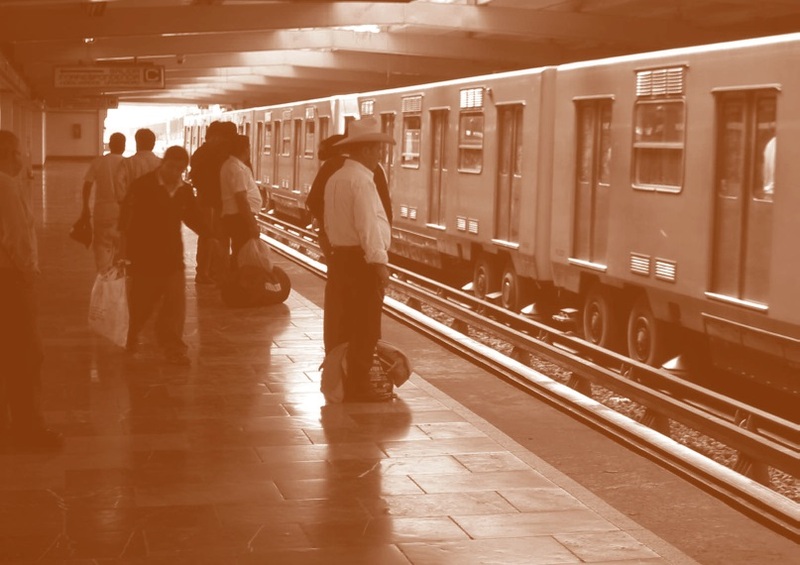 Although Mexico City’s metro system is centrally located, most transit riders are not. Since the first 13-kilometers of the metro opened in 1969, most population growth has been in areas without metro service. Only 11 of the current 192 metro stations are located outside of the Federal District of Mexico City, an area that accounted for just 17.5 percent metropolitan population growth between 1970 and 2010. By 2010, 56 percent of metropolitan residents lived in the surrounding states of Mexico and Hidalgo. Nevertheless suburban residents rely on transit for a greater share of trips than those living in the Federal District—65 percent compared to 60 percent. 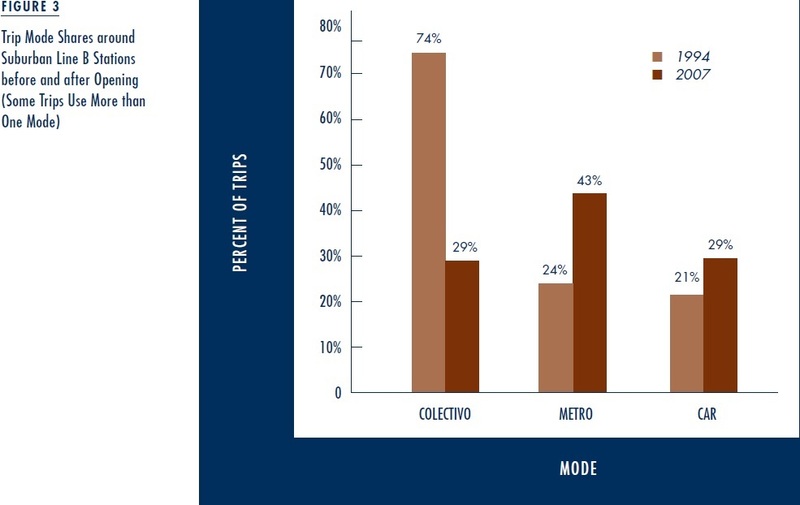 Suburban residents are particularly reliant on colectivos, but also use the metro with similar frequency (18 percent) compared to residents of the Federal District (19 percent). As a result of high suburban ridership, average daily boardings are particularly high at end-of-the-line stations. More than two-thirds of all metropolitan trips on the metro connected to a colectivo. Another 14 percent of metro trips linked to public buses, light rail, and other vehicular modes. Just 3 percent of metropolitan trips relied exclusively on walking and the metro. Despite rapid peripheral development and high suburban transit use, the government has only recently begun to invest in suburban high-capacity transit. Of the eleven metro stations in the State of Mexico, eight are on Line B, which provides metro service into the northeast. The 24-kilometer Line B opened in two phases, in 1999 and 2000, and cost $1.3 billion in 2013 US dollars. The line runs underground from east to west along the northern half of the center of the Federal District before emerging and running northeast into Ecatepec along the Avenida Central. As in many suburban municipalities, Ecatepec’s residents are poorer, have lower car ownership rates, and live in more densely populated neighborhoods than the metropolitan average. And like in many other suburban areas, Ecatepec’s population has grown rapidly over the past four decades. As one of the earliest of Mexico City’s few suburban high-capacity transit investments, the Line B extension can shed light on the likely effects of future suburban transit expansions. After a period of modest decline from 1994 to 1999, aggregate annual boardings appear to increase as a result of the opening of Line B (Figure 2). 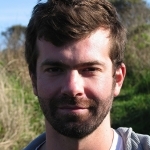 However, it is extremely difficult, if not impossible, to disentangle the effects of Line B on aggregate annual metro boardings from other shocks, such as the 1994 devaluation of the Mexican peso and ensuing economic crisis, or the more than doubling of metro fares from 40 centavos to 1 peso in December 1995. Furthermore, many of the riders who now board at Line B stations would still be riding the metro in the absence of Line B, but boarding at different stations. To account for these larger trends, this study examines land use and travel behavior around stations before and after the investment and compares them to five separate control areas. Line B reduced average travel times and expenditures on public transportation for nearby households and throughout Ecatepec. Residents living within a kilometer of stations in 2007 saved an average of 1.5 minutes and 2 pesos per transit trip (including those that did not use the metro) relative to 1994. By contrast, travel times and prices increased in the control geographies. These savings came primarily from households making trips to central locations in the metropolis. 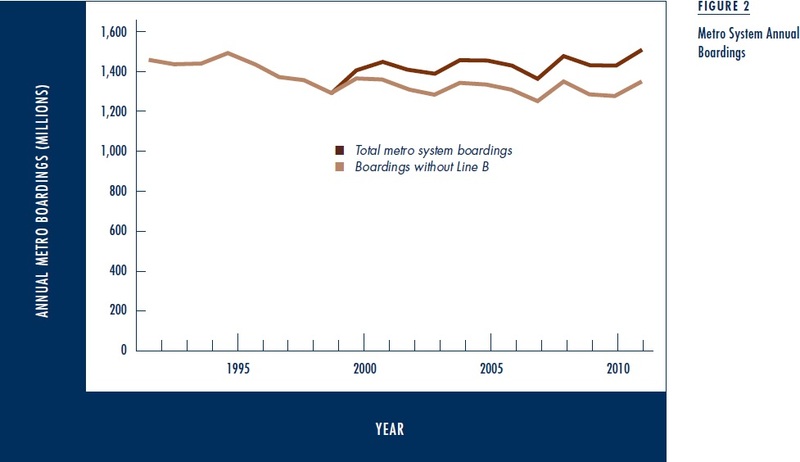 Lower costs and faster speeds have encouraged a significant increase in metro use. Residents within a kilometer of Line B’s stations were nearly twice as likely to use the metro on a given trip in 2007 as in 1994. Compared to an average metropolitan resident, they were more than twice as likely to use the metro in 2007 and eight times more likely to rely exclusively on the metro. 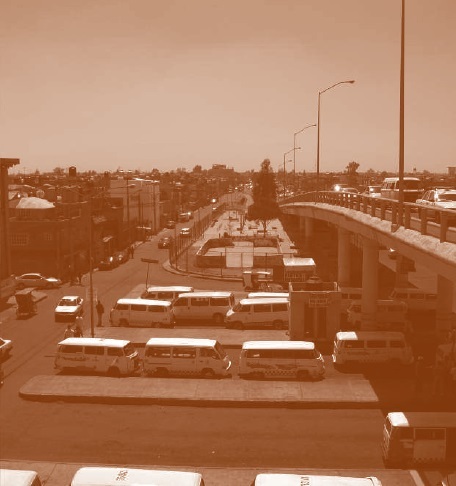 The share of trips by all residents of Ecatepec using the metro increased a more modest 11 percent. The increased metro use has primarily come from former colectivo riders. Figure 3 shows the share of trips by households living within a kilometer of Line B stations that used a colectivo, the metro, or a car in 1994 and 2007. Although colectivo mode share declined throughout the metropolis, the decrease was notably stronger around Line B stations than in the control areas. Car use also increased throughout the metropolis, including around Line B and throughout Ecatepec. If Line B affected car use at all, it marginally constrained its growth in a localized area of a municipality where car use has been rising rapidly. (The automobile mode share increased by 38 percent around Line B, compared to 50 percent in Ecatepec.) While transit travel speeds increased for residents near Line B, travel speeds for other modes declined even more quickly around Line B than in other areas. 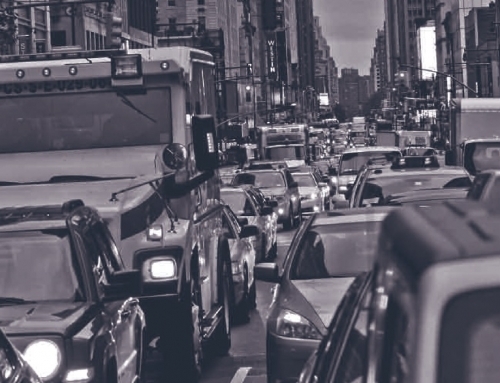 This is likely related to fast-growing congestion and car use along the Avenida Central, an important northeast corridor for cars as well as the metro. By increasing the number of stations in the suburbs, Line B’s construction quintupled the proportion of residents of the State of Mexico living near the metro. Nevertheless, a smaller proportion of all metropolitan residents lived close to metro stations in 2007 than in 1994, due to decreasing station-area densities in the Federal District and rapid growth in the most peripheral municipalities. Population density increased by 17 percent around Line B, but decreased by 11 percent around all stations. In sum, Line B appears to have significant local effects, but these are modest in relation to overall trends in settlement patterns. Mexico City has grown much more rapidly away from metro stations than around them. Line B’s influence on trip destinations, and thus its likely impact on central urban form, is less pronounced than its relationship with residential density. In general, the proportion of all trips, including work trips, to the urban center decreased from 1994 to 2007. This decline has been less pronounced around Line B, where the proportion of work trips to the center actually increased. Nevertheless, if Line B has influenced central commercial development, the effect has been small and difficult to measure. The most notable commercial office growth has been in the notoriously transit inaccessible Santa Fe neighborhood. The Line B experience suggests that suburban metro extensions do not substantially reduce congestion, but succeed in improving travel for low and moderate income households. Suburban transit investments will likely concentrate housing development and encourage a shift from informal to formal transit in the immediate vicinity. But these investments will do little to change overall development patterns or reduce private car use. Since high-capacity transit creates less congestion, less pollution, and fewer collisions per trip than informal public transportation, a shift from informal transit to the metro may have additional public benefits. Perhaps most importantly, the metro provides high-quality service during peak hours, when congestion significantly reduces travel speeds for other modes. Suburban expansion also appears to be an effective way to maintain and increase metro mode share. Like Ecatepec, many suburban municipalities have lower household incomes and car ownership rates than the metropolitan average. These municipalities are becoming more densely populated over time and continue to absorb most metropolitan growth. Perhaps most importantly, the metro provides high-quality service during peak hours, when congestion significantly reduces travel speeds for other modes. Despite the promise of higher ridership, expanding high-capacity transit into the suburbs faces several challenges. First, providing similar metro coverage per capita in the State of Mexico as in the Federal District would require at least 230 additional kilometers of metro. Given lower population densities in the most peripheral neighborhoods, more track and stations would be needed for equivalent service. At the same cost per kilometer of Line B, that would amount to $12.4 billion in 2013 US dollars. Second, only new trips generate new revenue, given the flat fare system. 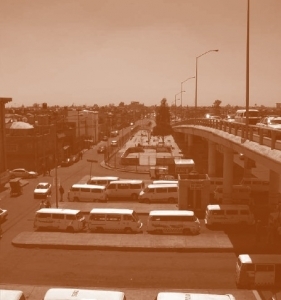 In Ecatepec, 24 percent of trips already used the metro in 1994. In 2007, this figure increased to 27 percent. Even residents of the most remote municipalities, well outside of the metro service coverage, used the metro during 14 percent of weekday trips in 2007. Each new suburban investment reduces the overall ratio of fare revenue to capital and operating costs, and raises total costs. As a result, systematic attempts to increase metro coverage will require changes to fare policy or greater subsidies. 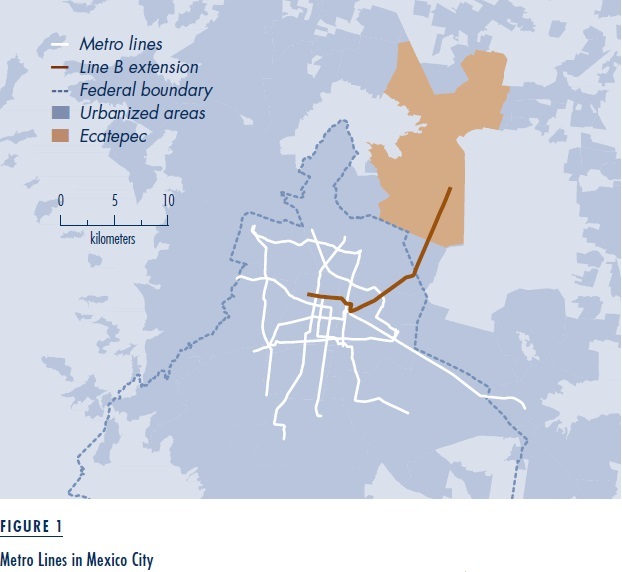 This article is adapted from “Mexico City’s Suburban Land Use and Transit Connection: The Effects of the Line B Metro Expansion,” originally published in Transport Policy. Amado Crôtte, Daniel Graham, and Robert Noland. 2011. “The Role of Metro Fares, Income, Metro Quality of Service and Fuel Prices for Sustainable Transportation in Mexico City,” International Journal of Sustainable Transportation, 5(1): 1–24. Erick Guerra. 2014. “Mexico City’s Suburban Land Use and Transit Connection: The Effects of the Line B Metro Expansion,” Transport Policy, 32: 105–114. Bernardo Benítez Navarro and O. Gómez González. 1990. “The Mexican Experience: Metro in Mexico City,” Rail Mass Transit for Developing Countries: 175–185.